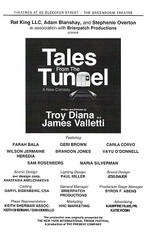 Tales From The Tunnel highlights six actors playing nearly 100 characters in a series of humorous, heartbreaking, and insightful accounts of true New York City Subway experiences, woven together into an entertaining ride. Tales From The tunnel consists of many independent short segments, lasting an average of about 30 seconds each. If you don't live in NYC, you probably won't enjoy this performance, since many of the stories play off subway experiences we've all had. The mood of the segments was quite mixed - some were humorous, some were heartwarming, and others were emotional. Even though each skit was short, somehow I found myself able to relate to many of the characters. I guess that means the actors did a great job. Tales from the Tunnel is a collection of stories from the New York subways. The stories are told through a mix of monologue and short skits. The stories ranged from humorous, to romantic, to nostalgic, to heartwarming and sad. The actors did an excellent job of portraying the many different characters, accents, and behaviors. Riding the subway everyday I have often felt that there are many stories to be told from the trains. It was interesting to hear about them in this play. Some of the stories were things I have seen many times and could relate to, while others were unexpected and surprising. I don't know if someone who does not live in a city with subways would appreciate the show, and I'd be hesitant to recommend it to someone who may be cautious about riding the subway - this play may scare them from ever riding it again.